I really love cheese, but it tends to be something I don’t each much of because of the typically high fat content that you find in it… then again it doesn’t mean that I have to stay away from cheese… and thank God for that. I made two very different sandwiches with these cheeses. 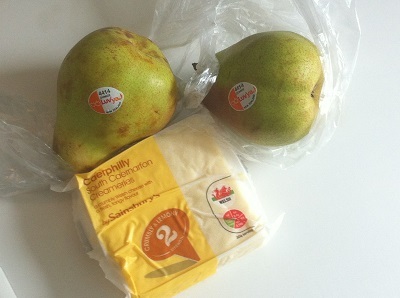 So here I mixed the Comice pear (was buttery and juicy with a strong pear taste) with the Caerphilly cheese (mild, soft and tangy) to make a toasted bagel. These flavours were a perfect match with the Caerphilly acting as a truly amazing melter cheese. I later had the remaining cheese with a Wagyu beef burger (from Asda, who knew?) and, again, it formed a great partner since it was mild enough not to overpower the delicate and delicious flavour of the beef. Okay now this was a slightly weird quesadilla I made. Cheshire cheese, chopped gherkins, roasted red pepper and garlic mayonnaise. What can I say? It was lush. It feels a bit weird to have tortilla as a food list item (especially this late) but I guess it would be more exotic if you were living in Britain twenty years ago. My love of gherkins comes from my nan who used to include them in her potato salad, and I have been known to eat most of a jar and then feel very sick afterwards because of all the vinegar. I also enjoyed the crumbly and creamy Cheshire cheese which, like the Caerphilly, was a good melter. 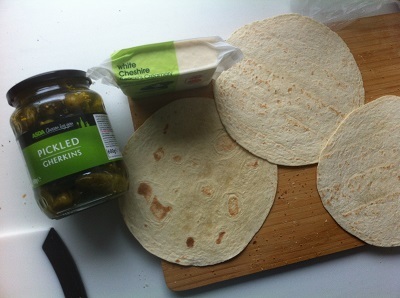 This one had a stronger flavour though which meant it was able to hold its own against the big flavours in my quesadilla.